Gretchen Harris Sperry is the Chair of Hinshaw's Appellate Practice Group, which is ranked Tier 1 nationally by U.S. News – Best Law Firms. She has represented clients in numerous state and federal courts of review, including the United States Supreme Court. As a former appellate court clerk, Ms. Sperry applies her experience and understanding of the judicial process at all stages of litigation, from drafting critical motions and appeals to developing long-term legal strategies in complex commercial litigation, constitutional litigation, labor and employment matters, and high-exposure catastrophic injury cases. Ms. Sperry also has developed an expertise in handling the sensitive and unique legal issues that arise at the intersection of law, politics, and government. She is experienced in white collar criminal matters, having represented individuals and entities in federal criminal prosecutions and investigations, as well as conducting internal investigations in anticipation of government involvement. Ms. Sperry frequently represents government agencies and elected officials in constitutional litigation as a court-appointed Special Assistant State's Attorney. She also represents private sector clients before various governmental, legislative, and regulatory agencies, counseling them on pending legislation and regulatory compliance matters. Prior to joining Hinshaw, Ms. Sperry was a Judicial Clerk to the Honorable Mary Jane Theis and the Honorable Maureen E. Connors in the Illinois Appellate Court. During her time in the Court, Ms. Sperry assisted in researching and drafting judicial opinions and dispositional orders in all areas of the law, including insurance coverage, contract disputes, corporate and partnership formation, fiduciary duty, personal injury, professional liability, declaratory judgment actions, appellate jurisdiction, evidentiary issues, and criminal matters. Among her law school accomplishments, Ms. Sperry served as a judicial extern to the Honorable Michael T. Mason, U.S. District Court for the Northern District of Illinois. She was also the Publication Editor for the Annals of Health Law and a Senior Research Fellow for Dean Michael J. Kaufman. She was a member of the Dean's List and earned the CALI Award for the highest grade in Legal Writing and Education Law. Ms. Sperry also competed on the Giles Sutherland Rich Intellectual Property Moot Court Team. 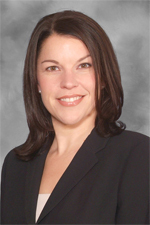 Ms. Sperry is an active member of the legal community. She was appointed by the Illinois Supreme Court to serve as a member of the Character and Fitness Committee of the Illinois Board of Admissions to the Bar. She has served as an adjunct faculty member at two Chicago law schools teaching Appellate Advocacy. She also serves as the Vice President of the Illinois Appellate Lawyers Association and is actively involved in the Women's Bar Association of Illinois.